Sign up for our sandbox account for a testing enviroment. Login with your merchant account, under 'Tools', select 'Payment Link' and fill in the mandatory textfield. To learn more about the parameters, please check the 'Button parameters' table of 1. Embed the Payment Button. This ID can be served as the merchant reference ID. This ID should be unique in the merchant system. The total amount to be charged to the customer credit card. It should be the sum of the subtotal for each item, delivery charge, discounted amount and tax amount. URL to go when users have completed the payment in SmoovPay page. URL to go when users click 'Cancel' in SmoovPay page. Item : Title/name for item x (x can range from 1 to 20). Eg. $4.99 Voucher deal. Description : Description for the item x. Items Quantity : The quantity for item x. Items Amount : The unit price for item x. To get started, add the following 'sample code' to your checkout page. For details of each parameter, look at the 'button parameters' table after the sample code. version Fixed. Please use '2.0'. merchant Email address/user ID of the merchant account registered with Smoovpay. ref_id This ID can be served as the merchant reference ID. This ID should be unique in the merchant system. item_name_x Title/name for item x (x can range from 1 to 20). item_description_x Description for the item x.
item_amount_x The unit price for item x.
item_reference_x (optional) The product reference Id or SKU for item x. If specified, the parameter 'tax_percentage' must be specified. If specified, the parameter 'tax_amount' must be specified. currency Currently, SmoovPay supports only 'SGD' and 'USD'. total_amount The total amount to be charged to the customer credit card. It should be the sum of the subtotal for each item, delivery charge, discounted amount and tax amount. success_url URL to go when users have completed the payment in SmoovPay page. If 'skip_success_page' flag is set to '1', customer will not see the SmoovPay success page after payment is made successfully. The customer will instead be redirected back to the provided 'success_url'. The description for each field is exactly the same as the STR fields. Please refer to the 'STR Parameters' section for more information. cancel_url URL to go when users click 'Cancel' in SmoovPay page. str_url (optional) SmoovPay Transaction Response Url. When a payment is successfully paid, SmoovPay Server will post a STR to this URL with the transaction details before the customer is redirected to the 'SmoovPay Success Page'. If specified, the parameter 'customer_contact' must be specified. If specified, the parameter 'customer_idd' must be specified. customer_email (optional) New!Customer email address to be pre-populated into the Email field inside SmoovPay checkout page. signature An unique signature generated using the 'Secret Key' found in your merchant setting page. For more information on the signature generation, please refer to the 'Signature Generation' section. signature_algorithm Fixed. Please use 'sha1'. Hash the concatenated string using SHA1 algorithm. We recommend you to use Apache Commons Codec (version 1.7+) for the hash function. In this method, server to server call is used. Hence the signature is not required in the POST form. to make a server to server POST to SmoovPay server. 2. SmoovPay will return a JSON response. 3. Decode the JSON response to retrieve the 'redirect_url'. 4. 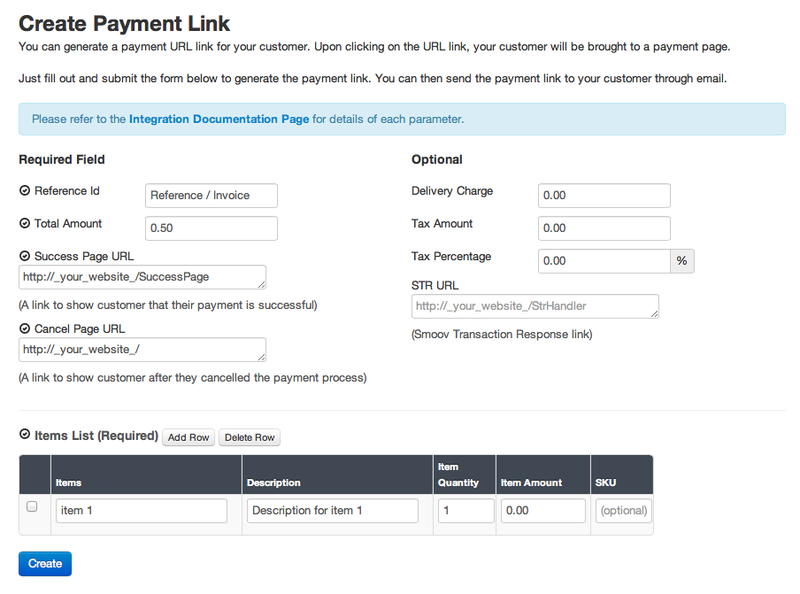 Redirect the customer to the 'redirect_url' to continue with the payment. Please refer to Button Parameters for more parameter information and usage. Note! The "signature" and "signature_method" parameters are not required in this method. redirect_url string The url to be used to redirect the customer to immediately. merchant string(70) Your account email address. total_amount decimal(11,2) Amount paid by the customer using credit card. signature string An unique signature generated using the 'Secret Key' found in your merchant setting page.